Bill Gates of Microsoft is one of the wealthiest individuals in the world, so when he speaks it is not surprising that the world tends to listen. In a recent interview, Gates has said that capitalism is inherently unable to solve the problem of global warming, and instead there have to be world-encompassing government-business “partnerships” to save Planet Earth. In the November 2015 issue of “Atlantic” magazine, Bill Gates asserts that private enterprisers are too self-interested, too narrowly focused on short-run market profitability, not innovatively-oriented enough, and not sufficiently incentivized to develop on their own the needed alternative energy sources that can eliminate the use of fossil fuels by the middle of the twenty-first century. Thus, the only answer is for governments to design an agenda and a plan of action to direct and subsidize the private enterprises that cannot be trusted to solve what he considers the leading problem facing everyone in the world: climate change and global warming. He pushes aside anyone who questions that: (a) global warming is actually occurring in a scientifically meaningful sense, and (b) that “man” is a leading if not the primary cause of this threat to sustainable life on Earth. He asserts that anyone who can do a little “math” should see the truth of humanity’s dilemma and the magnitude of its danger. I do not in anyway claim as an economist to know very much about the scientific evidence or its reliability. But there are enough natural scientists and social scientists whose judgment I trust and respect to believe that the case for climate change and global warming is not necessarily a “closed book,” with no basis for questioning the evidence or the climate models used to make the frequent forecasts of planetary doom that are bandied about. But let us assume for the sake of the argument that the dire predictions were to be true. And that the projected and feared increases in average temperature around the globe threaten to have some or many of the negative effects that are often warned about. Is Bill Gates correct in his bad-mouthing of private enterprise and his praising of the superiority of government direction and subsidizing of businesses to find solutions to the problem, if it exists? 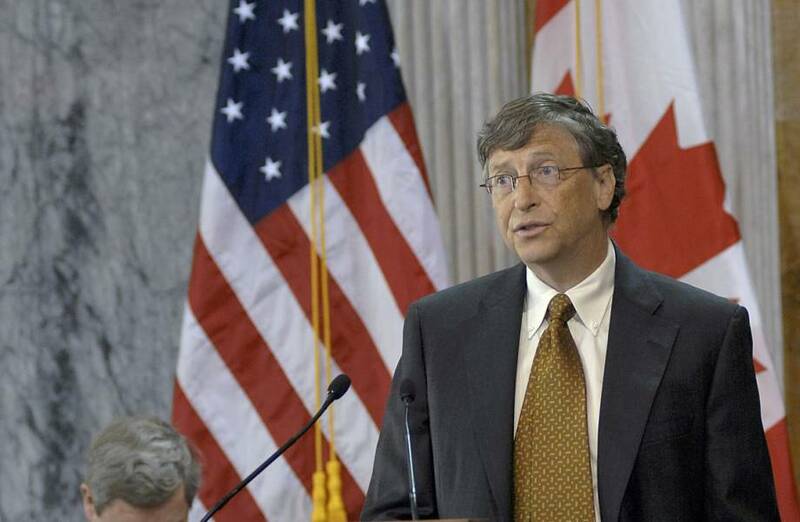 A number of news and editorial outlets that have commented on Bill Gates’ remarks have said that he declares that only “socialism” can save the planet. In fact, he never uses the word socialism anywhere in the interview, as best as I can tell. But his comments do raise the issue of the institutions of a market economy versus the workings of the political process. Since the time of Adam Smith in the eighteenth century, economists have explained and emphasized that there is no denying that people are guided by the pursuit of whatever they come to consider to be their own “self-interest.” Self-interest, however, comprises more than the distorted and cliché conception of the greedy person who cares for nothing except his own narrowly defined material desires. Reasonable economists and social scientists in general have always insisted that for people in the real world self-interest includes and incorporates whatever the individual considers to be of value and importance to him. This may include family and friends, neighbors and the community in which a person lives. It can also extend to a serious and thoughtfully benevolent concern for the betterment of humanity as a whole. But whatever maybe the horizon and content of the individual’s concerns, they are what he defines as important and of value to him. The question is, how shall he proceed to attain the goals and values he wishes to pursue and provide for? The unique character of the free market society is that it is based on the idea of the rights of the individual to his life, liberty and honestly acquired property. The “rules of the game” in the competitive market economy are fairly simple and commonly shared by most rational and reasonable people: you don’t kill; you don’t steal; and you don’t deceive or defraud. This means that all human relationships are based upon and require the voluntary choice and mutual consent of the participants. If you want something that another has, you must apply your knowledge, talents and abilities to produce and offer to that person something that they may value more highly than what they have that you want, and therefore will be willing to give to you in trade at terms that have been agreed upon. This is what Adam Smith and others after him meant by the phrase that, as if by “an invisible hand,” each individual following his own self-interest in the competitive market at the same time serves to improve the circumstances of others in society, even if it was not the original motivating and conscious intention of any of the people participating in the arena of what is, now, a vast market of global trade and exchange. Precisely because of the inescapable self-interested conduct of each and everyone of us, we all have a motive to wisely, thoughtfully and effectively use, husband, and improve the property that we own whether it be the “human capital” of our own skills and abilities, or the resources and physical capital equipment in our possession, or the financial assets through which we save, investment and plan for the future. Why? Because all of these productive means to our various self-interested ends depend upon not wasting and wrongly applying them in ways that diminish their value and usability both in the present and the future. Don’t repair the roof on your house and you not only risk ruining everything inside when it rains but also you diminish or even destroy its resale value sometime in the future. Too wastefully or hastily use up a resource that has marketable value both now and in the future, and you reduce its capacity and availability to enable you to earn income in the years ahead to acquire the things that money income can buy both now and then. This is why businesses take valuable and productive machinery off-line for repair and maintenance so as not to have to incur a greater expense to replace it sooner than would have to be the case. Or why the farmer leaves fields fallow to restore nutrients in the soil so the land may be used for generating profitable crops in future years. When property rights are secure and income received from profitable use is allowed to be retained by individuals owning that property, the more that prospective gains and personal improvements act as positive incentives for thinking ahead, and planning and acting with opportunities in the future in mind. The Austrian-born economist, Joseph A. Schumpeter described the market-oriented entrepreneur as the positive innovator of change who, precisely in the pursuit of self-interested improvement and profit constantly, transforms the society through innovations that improve the quality of existing products, offers new and previously unimagined new products, introduces new and more efficient technologies to more cost-efficiently bring goods to market, and devises ways to more effectively organize private enterprises to get more of what people desire through the better arrangement of the production process. Schumpeter famously called it the market’s competitive process of “creative destruction,” which innovatively substitutes the existing productive means of providing standards of living in society with better means and methods that improve the quality and standard of life for virtually all over time. Contrast this with the motivations and incentives of politicians and government planners and regulators. Those in political office or who manage the government bureaucracies have no “assets” to use and spend other than those that have been taxed away from the citizenry of the country. Their effective control over those tax funds and government-owned assets extends no further than the next electoral cycle, the outcome of which can see them removed from office and replaced from their senior positions of power. Hence, the politician’s horizon of personal interest and planning rarely extents beyond the next election, whether that be two, or four, or six years away in the American political system. And those who hold the appointed senior positions in the departments, bureaus, and agencies retain their power only for as long as they focus on and serve the interests of the president who has made them the head of a branch of the bureaucracy. Short-term pay-offs that offer vote-getting photo opportunities, or that satisfies the financial and related interests of individuals and groups whose pockets can provide the campaign contributions for the next run for re-election, or positive “images” for the media and future history books as part of the “legacy” of a president (or prime minister) are as far as those who guide and direct governmental policies and actions have as their decision-making time horizon. The private enterpriser in the marketplace invests his own money or borrowed funds for the use of which he has entered into legal obligations to pay back with interest. When the businessman plans the construction of a new manufacturing factory that once built can stand and be productively used for decades; or purchases land that has on it raw materials under the ground or timber on the surface, for instance, that have marketable value and profitability for even a century ahead if properly conserved and economized; or who buys expensive and durable capital machines, tools and equipment the productive lifespan of which may extent, with proper maintenance and repair, for many years into the future; when he does any or all of this, he must weigh the financial gains in the present with the profitable rewards that may be available in the future with wise use of the private property that he oversees, manages and owns. Who, therefore, has the greater personal incentive and financial motive to take the future into account before making decisions in the present? The market-oriented private enterprisers who must carefully weigh how his present actions will have a positive or negative effect on his abilities to earn desired revenues and profits in the future, depending on how they wisely use their own property? Or the politician who spends other people’s tax-collected money and has no permanent “skin-in-the-game” outside of his ability to pander to special interest groups before the next election to obtain from them campaign contributions and votes on election day? While, clearly, politicians, scientific “experts,” and non-governmental organizations that share Gates’ views on the form and types of “solutions” to environmental and related problems are far-seeing, thoughtful, and “rational” in understanding what sacrifices and actions are called for in the present to save the future from disaster. In a free, competitive market, private enterprisers direct their production activities to serving and satisfying what they perceive as the most likely and profitable consumer demands of the future. This applies no less to the environment than any other aspect of economic life. One of the most vital functions performed y a free market economy is to assist in economizing and preserving resources that people value and that are limited in supply. Nothing is a stronger force for conservation than the profit motive and the institution of private property. When a person is allowed to own something, he has incentive to think twice before he wastes or abuses it. If he does waste or abuse what he owns, he directly suffers the cost because he loses the benefits that could have been his if only he had shown more care. And nothing is likely to result in greater abuse and misuse of something than when it is owned by nobody. What is worth preserving in nature? What are the best means and methods to care for resources? Should we merely maintain what we have, or should we expand its supply? Have we set aside too much and, in fact, encroached too heavily on the attainment of other ends we also value? Even the most ardent environmentalist – unless he is one of those few extremists who would like to see man extinct in the belief that everything is worth preserving except the human race – believes that some land also must be used for residential housing, for places of work, and non-wildlife recreation. To live, man must grow food, raise animals, and use resources for clothing, the daily amenities of life, and the arts and sciences. The advantage of leaving these problems to the marketplace is that it is then up to the people themselves to decide these issues. Suppose that people want more wildlife areas for aesthetic appreciation or recreational enjoyment. The greater demand for these things, as expressed in the prices that consumers are willing to pay, increases the profitability for land and resources owners to use less of what they own for other purposes and instead shift their resources and property into these more highly valued uses. If owners of land and resources most attractive for these purposes fail to do so, they will miss out on the higher income they could be earning. If an increased demand for housing and arts and crafts brings about an increased rate of deforestation, the remaining forests not yet touched by the woodchoppers axe will rise in price because of their increased scarcity. This creates incentives on the part of the forest owners to think ahead and replant trees as a greater rate, so the prospective higher profits can be reaped in the future through harvesting or through other uses valued by consumers. If urban areas begin to encroach on areas of natural beauty – and if members of the society value them enough to be willing to pay for their preservation – the market will see to it that ownership of these areas passes into the hands of these people because that where the greatest monetary return is expected. Where are pollution problems, ecological imbalances and assaults on areas of natural beauty most often taking place? Invariably, they are taking place in areas in society in which private property rights have not been permitted or have not been clearly defined and enforced. No one knows for certain, in these cases, “what is mine and what is thine.” In many of these areas, the resources in question are either in a no-man’s-land of non-ownership or they are under the jurisdiction of the government. Non-ownership always produces what is known as the “tragedy of the commons.” Where there is no owner, there is no or a reduced cost for excessive misuse of a resource. And when no one directly feels the cost – in terms of lost income or depleted resale value – then everyone who has access to that ownerless resource will try to get as much out of it as is possible before others do. When property rights are not clearly defined, people will often act in ways that do not take into consideration the full effect and cost upon others. Resources, or land, or the air are wrongly or excessively used because the users do not have to weigh or pay for the full consequences of their own actions upon others. This is the source of practically all of the environmental and pollution problems that are cause for concern today. If “climate change” and “global warming” are, in fact, problems facing people on Planet Earth, it is due to an atmospheric tragedy of the commons. The question, then, is, are there private solutions to this problem – if it exists as proponents claim – or does it have to be “solved” through the central planning of global governments and government-business “partnership” as asserted by some such as Bill Gates? That is what will be discussed in next week’s article.